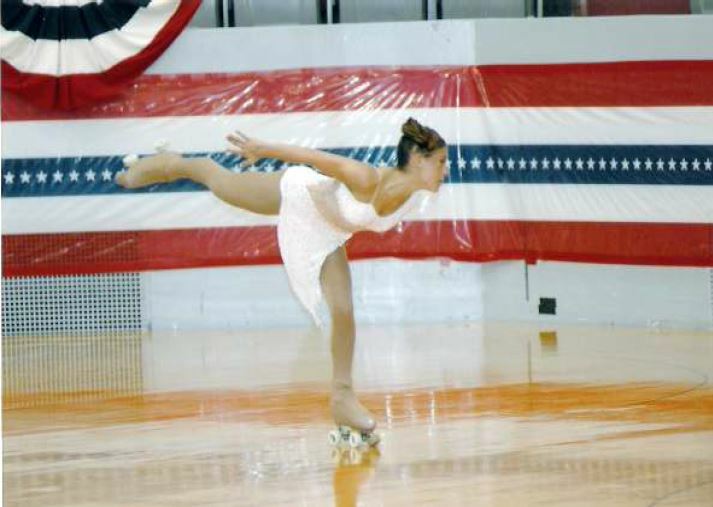 Artistic Movement, Physical Strength & Conditioning, with Mental Control to put it all together in a set time routine, that is what free skating is all about. Meghan Burt United States Sophmore Lady Free-Skating Champion,United States W.C Pairs Champion, and World Team member. Free-Skating is perhaps the most popular of all the skating forms. Free skating around the world has an enormous participation level with skaters of all ages attempting to jump, spin, spiral and spread-eagle, with or without music. Free skating is an individual sport with skaters working on their own, with only the assistance of a coach for both technical and moral, and physical and mental support. Today's free skaters at championship level, will exhibit all of the doubles jumps and maybe some triples. Jumps are integrated to make complex jump combination. Spins range from single-position spins to combined position spins and the more athletic jump spins. Foot work should be very complex with obligatory step sequences and patterns.